BASE presented its 2015 Practice Awards at the conference dinner on 9 September at the Queen's Hotel in Leeds. We would like to congratulate all the winners and thank the sponsors of these awards; Olympus Care Services, Shaw Trust, and Working Links. This award is sponsored by Working Links. 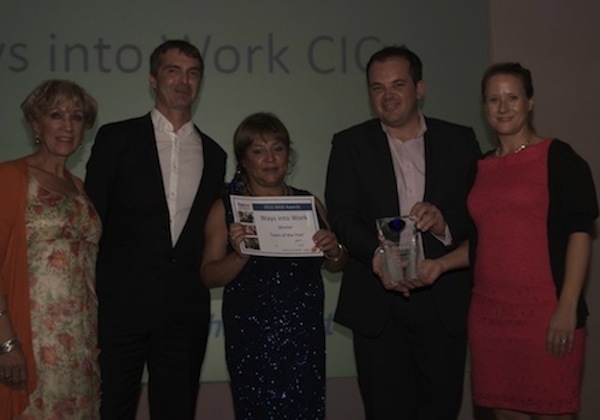 Team of the Year winner, Ways into Work CIC, are from Windsor and Maidenhead and collaborated with Manor Green School to initiate really positive changes for young people with a disability which resulted in an unprecedented number of work placements and job outcomes for students. Pictured above (l-r) are Debbie Burnett, Ian May , Sandra Briggs and Laura Davis of Ways into Work with Dan McCormack (second right) of Working Links who presented the award. This award is sponsored by Olympus Care Services. 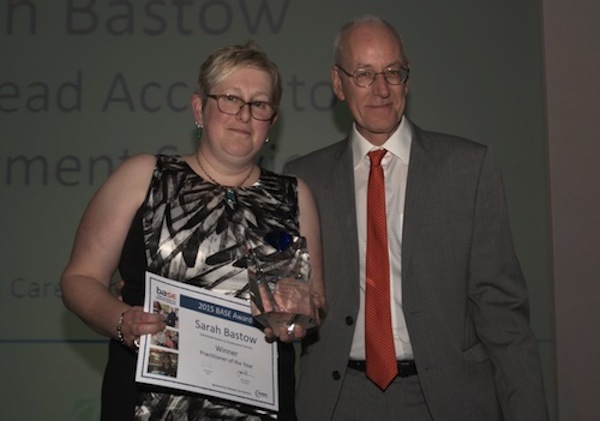 Sarah Bastow, of Gateshead Access to Employment Service, was acknowledged as Practitioner of the Year. Sarah was nominated for her 25 years commitment to the sector and because she exemplifies the ‘zero rejection’ principle of Supported Employment. She frequently supports those with the most complex needs to pursue and achieve their employment aspirations. Sarah is pictured above after receiving her award from Harry Corrigan of Olympus Care Services. This award is sponsored by Shaw Trust. 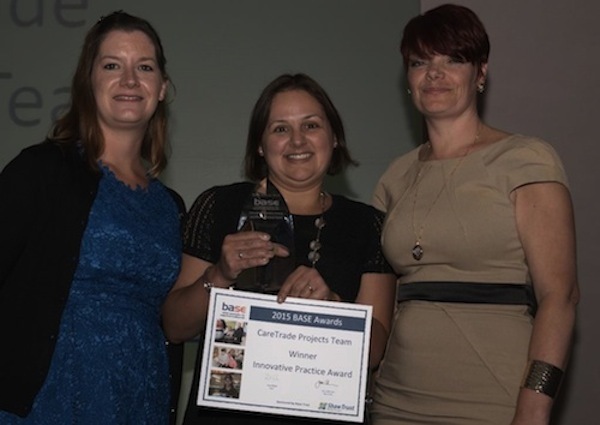 Care Trade Projects Team, Innovative Practice Award Winner, is a relative newcomer to the supported employment model. Starting with the first project 5 years ago with Guy’s & St Thomas’ Foundation Trust and partners Orchard Hill College, they’ve helped young Londoners with autism prepare for work. They have gone on to pioneer work placement programmes with Barclays and London South Bank University and their plans for the future include a training bakery in central London and a farm with a difference. Pictured above (l-r) are CareTrade's Demelza Danaher and Judith Kerem who received their award from Sam Peplow of Shaw Trust. 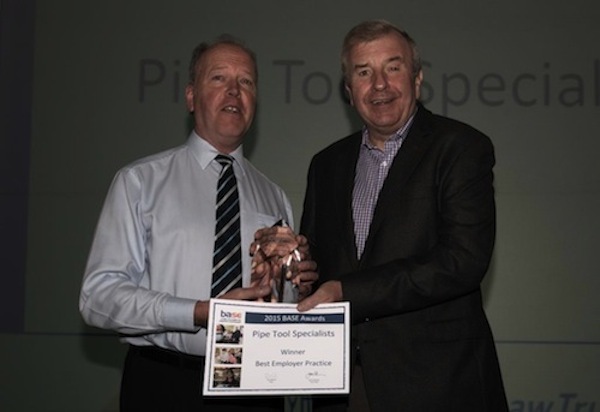 This regional award was presented to Pipe Tool Specialists ( PTS) from Lincolnshire. They were nominated by Linkage Community Trust . PTS are proactive in creating a diverse workforce and have actively sought out ways in which they can employ individuals with disabilities following the ethos of partnering the ‘right candidate’ with the ‘right job’ and ‘right support’ . PTS's Steve Stefaniuk (left) is pictured with guest presenter, Martin Lodge. Mark Appleton was the recipient of the David Grainger Award, which is presented to a person with a disability making outstanding progress in their employment and who is a significant team player who always supports his or her colleagues. Mark, an employee of Vision Office in Leeds, says “Thanks to Pluss and Richard at Vision Office, it is great to feel part of a team and it has helped me overcome a lot of my personal issues and get on with life again.” . 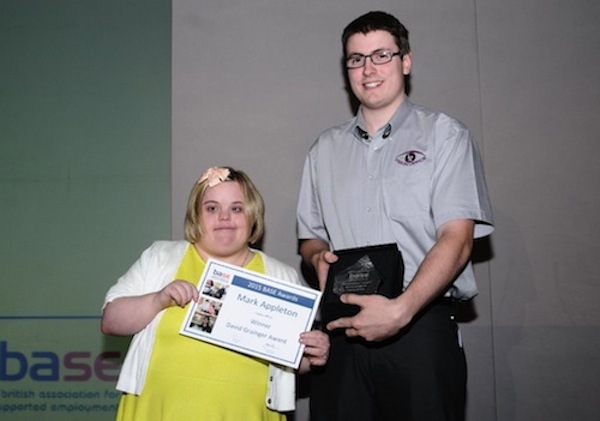 Mark is pictured receiving his award from keynote speaker, Laura Green of Serendipity. This award is presented to a practitioner undertaking the Level 3 Certificate for Supported Employment Practitioners who has demonstrated the most progress and achievement through the year. 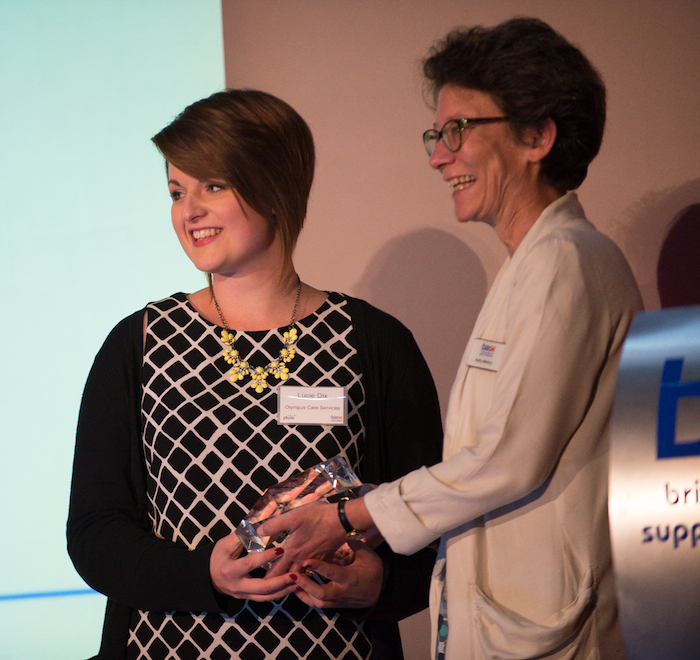 Lucie is pictured above (left) receiving her award from Kathy Melling of BASE.